In the second part of this blog, instead of just thinking about the house as whole, I thought I’d focus more on just the kitchen in which adding a touch of DIY could increase the value of your home. Using a fair bit of my real estate experience, my slow but steady gaining of DIY experience/knowledge and an article I found online here at TheMoveChannel, I thought I’d write this short piece to carry on with the series! Now no one is expecting you to have a PHD in electronics here and create your own fully functioning microwave with all the bells and whistles to go on it, however there are a few little neat tricks you can do to add a nice touch here and there. So here are a few of my home brewed tips on adding a touch of uniqueness, fun and a touch of value to your kitchen using a dabble of DIY! An interesting and neat little trick that I’ve seen in a few of houses is to show as much of the kitchen walls as possible. Removing big clunky and imposing cabinets and replacing them with shelves can really increase the illusion of space in the room. Of course this means that you’ll have to dust a little bit more often but hey, if your kitchen looks that good, who cares! ? Again this isn’t a massive DIY task but it adds to the overall charm of the kitchen. If you have the space, building a wooden rack or metal rack, which allows you to suspend your pots and pans above the workspace, will give you more surface space to create your Sunday roast! I think the picture above is a bit optimistic but that’s what I want mine to look like! A smaller and more realistic version should be pretty easy to build and there are plenty of tutorials online for you to follow if you need a hand, I know I will! Something that is also overlooked but can have a massive effect on a kitchen is the sink and tap area. Your old rusty and old looking sink can be a bit of a stomach churner, especially if you’re preparing food near it! Try replacing the sink with something a little bit more shinier and appealing. A great idea though is to add an instant hot water tap. I saw it in quite a few homes that I was showing to potential buyers and it was a nice little touch that impresses people more than you’d think actually. As the name suggests it gives you instant hot water without the effort of having to wait for the kettle to boil! Installation isn’t as difficult as you may think and you can usually buy the instant hot water tap online from company’s such as water boilers direct so all you need to think about is where around the sink you want it! 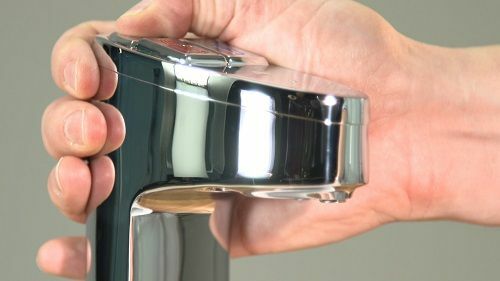 Instant hot water taps look amazing and very cutting edge and as the taps are plumbed in they provide an automatic fill. The access to instant clear filtered boiling water is a real time saver and they have advanced safety features so there will be no accidents. You can now boil eggs, steam vegetables, clean and soak roasting tins with ease and of course make you much needed morning coffee instantly. It really is a fantastic addition to any modern kitchen re-do. Now I must stress that if you’re not totally confident installing lighting yourself, it may be best to get someone to help you. A really nice addition to a kitchen is to get some subtle and warm lighting installed. Don’t just think of the traditional places though. I remember seeing a great little trick of installing some lighting at the floor level pointing outwards towards the kitchen. Looks cool, but how does one add cabinet toe kick lighting? Another way to add value to your home is to get professional cleaning services to clean your carpets, upholstery, tiles and renew everything that is worn out over time. Showbox Apk Raw I am happy you take pride in what you compose. This makes you stand way out from numerous different authors that push ineffectively composed substance. Much thanks to you so much Love your online journal. PlayBox HD APK is an app that lets you watch your favorite TV shows and favorite videos, all use it to watch videos and TV shows online, most people mostly use PlayBox HD to watch your favorite TV shows and movies. We do. Between millions of people, praise of PlayBox HD is increasing and there is a great deal of praise. The best thing about Playbox HD is that it does not buffer when you are watching TV shows and movies. With thousands of events at a time, managers need to send out invitations in real-time. Mass texting is the smartest way to do that with everyone attached to the cell phones at all times. They might not pick up call, check emails or social media but they will definitely read their text messages atleast once.